From self-designed cube boxes and personalised goodie bags to my biggest project so far - DIY Mickey/Minnie Mouse ears, I've always tried to add a twist to the party bags just so to make them unique for my guests. Yes, I'd like to think that they are one of a kind and can't be readily bought at any shop. They don't have to be difficult or complicated. In fact, adding one handmade item into a bag of commercialised goodies helps to give it the added touch which I like to call love. In this week of Creativity 521, I like to share with you three simple party favour ideas that you might consider doing for your child's next big birthday bash. It's become rather common to see professional balloon twisters at parties, fairs and private functions. Well, I even see them performing at train stations but still, every time I would be intrigued. In spite of the fact that I do love balloons which are inflated, I have a phobia of blowing them up and never fail to shriek whenever one bursts within a 10-metre radius. Nonetheless, for Angel's rainbow party, colourful balloons were the perfect choice for a party favour so I decided to conquer my fear. 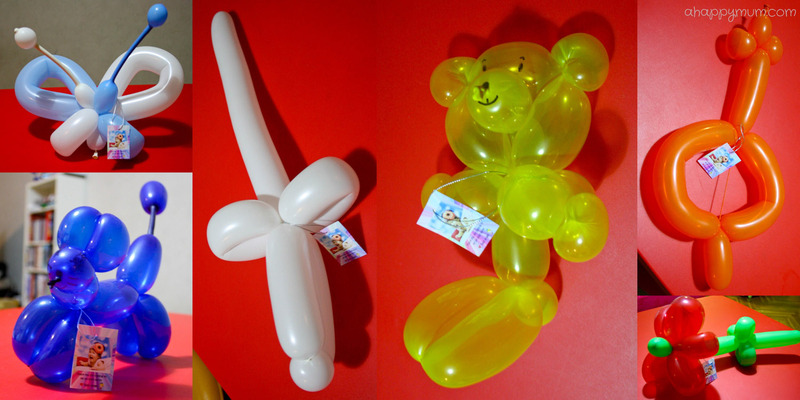 All you need are modelling balloons, a pump and instructional videos which you can find easily find on YouTube. The great thing about these balloon models is that you can select which to use based on your birthday theme! For instance, swords are cool for a pirate party, bears and dogs for an animal/zoo party, flowers and butterflies for a garden party, guitars for a rock 'n' roll party! If you feel like you're up to it, you can even hold a live show and demonstrate to the kids at the party how you magically transform the balloons into all kinds of fascinating shapes. Most, if not all, of us have probably done origami (Japanese art of paper folding) when we were a child. For my ROM beach party, I engaged my friends and together, we folded hundreds of cranes and swans. So when Angel turned one month old, I thought "Why not give away folded red hearts?" Do you feel the love within? There are all kinds of fanciful origami hearts you can learn to fold, these that I did are really simple to make! You can finish one within a minute and they made great fillings for the cube favours during Angel's baby shower. For the upcoming Safari birthday, I faced one of the hardest challenges ever. Long story short, we had bought tubes of animal figurines from Sweden and wanted to bring them back to Singapore. However, we realised we did not have space in our luggage for them and if they went with the shipment, they would arrive after the birthday party. One day, the hubby told me a friend could help us to bring them back. However, I had a total of 4 hours to wrap up the favours and personalise them while I still had access to my craft supplies. 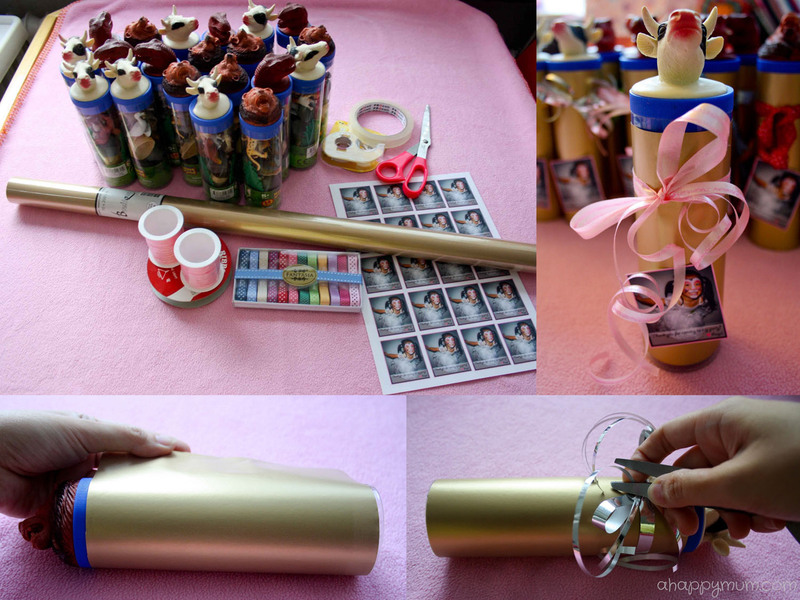 So, everything was a mad rush that day and I kept the gifts really simple without losing that DIY touch. All I did was to wrap them up with gold shimmer paper, tie colourful ribbons and most importantly, I stuck a "Thank You" tag along with Angel's bunny picture to express our gratitude to the guests who will be there. Well, at least now they don't look like they are simply bought from the store and I hope Angel's big smile in the picture will help to spread some happiness too. There, you have it. Just three very easy DIY tips that anyone can accomplish. So, why not try your hand at it and make your party favours truly unique next time? If you have other birthday ideas to share, do link up in this week's Creativity 521! The origami hearts are really cute. I actually don't know how to fold these... is there a tutorial or a link to one you know of? I've been wanting to learn balloon sculpting for a long time. You learnt it off YouTube?? Wow! Oh yeah Ai, I've been wanting to do it too and so happy I finally did so. Yesh, completely off YouTube. I learnt to make all the six models I listed, and they're honestly not as hard as expected! =) Do try when you have time! Four hours to do that AND take nice pictures some more? You really are super mum!!! Haha taking pictures was the easy part. =) But thanks for the compliment! =) I have lots to learn from you though! Cool, thanks for hopping by and glad you like the simple ideas! The balloon sculptures are so cute! thanks for sharing.